When I boarded the plane to Cairo, Egypt, to make sure everything was in place for the women's delegation headed to Gaza, I had no reason to think I'd end up in a jail cell at the Cairo airport and then violently deported. The trip was in response to a call from women in Gaza to CODEPINK and other groups asking us to bring 100 women from around the world to Gaza for March 8, International Women's Day. They wanted us to see, first-hand, how the seven-year Israeli blockade had made their situation intolerable. They talked about being unable to protect themselves and their families from frequent Israeli attacks and how the closing of the borders with both Israel and Egypt has made it impossible for them to travel abroad or even to other parts of Palestine. They wanted us to witness how the shortages of water, electricity, and fuel, coupled with severe restrictions on imports and exports, condemn most of the 1.6 million Palestinians in Gaza to a life of misery. The only ways to enter Gaza is by land--either via the border with Israel or Egypt. Israel restricts entry to non-governmental and official delegations, so our only option was to go through Egypt. CODEPINK had already organized eight delegations to Gaza via Egypt since 2008, so we thought we knew the ropes. We had organized these delegations during Mubarak's reign and after the revolution, but not since the July 2013 coup that toppled the government of Mohamed Morsi. As in the past, we furnished the Foreign Ministry and the local Embassies with all the information they requested to get the delegates the necessary permits to cross the Sinai (which has become a dangerous place) and cross into Gaza.They said as long the situation was not too dangerous in the Sinai, they would help us get safely to the border. Otherwise, we would celebrate International Women's Day together in Cairo. I went early, on March 3, as part of the logistics team. 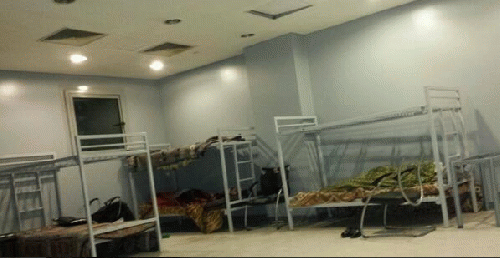 When I arrived at the airport in Cairo, I was taken aside and put in a separate room. First I was told "no problem, no problem, just checking the papers, just 10 minutes." After 5 hours I realized that there was, indeed, a problem, as I was taken to a jail cell at the airport. Never once was I told what the problem was. Thank goodness I had hidden my phone and was able to get the word out about my plight over Twitter . Friends and family started immediately contacting the US Embassy for help. At 8am , 5 plain-clothed men with handcuffs came into the cell, looking very ominous. One said, "Come with us, we're putting you on a plane and deporting you." I was scared to go with them and I had just received a message that someone from the US Embassy was just ten minutes away. I politely asked if I could wait for an embassy official or if I could call the Foreign Ministry to straighten out what must be a miscommunication. I was in such agony from a dislocated shoulder--you could see the bone just sticking up in the air--that the airline personnel refused to let me on and insisted that the Egyptians call an ambulance. When the ambulance arrived, the doctor immediately gave me a shot to ease the pain and insisted that I had to go to the hospital. By this time there were about 20 men on the tarmac, arguing about what to do with me while the Turkish plane with 175 people on board was prevented from taking off. After about an hour of fighting, the Egyptian security prevailed: I was not allowed go to the hospital but was forced to board the plane, with the two men who most abused me sitting on either side of me. As soon as we were in the air, the stewardess asked if there was a doctor on the plane. Finally, a stroke of luck! Not only was there a doctor, but he was an orthopedic surgeon. He created a makeshift operating bed in the aisle of the plane and got the stewardesses to assist. "Usually I'd put you out before doing this, so I warn you this will be painful," he said as he manipulated my arm back into its socket. Once we got to Turkey, I went to a hospital for further treatment before flying back home. My doctors here say it will take months of physical therapy before I can recover full use of my arm.